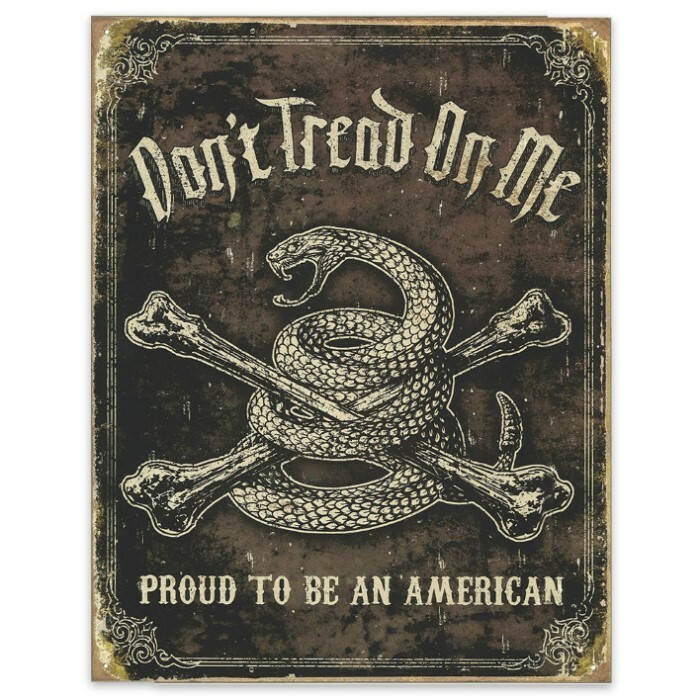 “Don’t Tread on Me” 12 1/2” x 16” Rustic Tin Sign | BUDK.com - Knives & Swords At The Lowest Prices! The iconic “Don’t Tread on Me” rattlesnake is poised and ready to strike on the front of this stylish rustic tin sign. Ever vigilant, he projects the same cautionary readiness he did on the original 1775 revolutionary Gadsden Flag, but this weathered black placard depicts the slithering, rattling serpent in a darker - some might say scarier - tone, intertwined with two human femur bones. In classic form, “Don’t Tread on Me” is emblazoned above the rattler, and “Proud to Be An American” below. The lettering blends 16th century old English with sharp lines and a distinctly gloomy jaggedness, and the entire sign is bordered with a vintage-style line frame. Both perfectly complement the sign’s cool, authentic-looking patina. At 12 1/2" wide x 16” high, this old-school tin sign is perfectly sized for hanging almost anywhere - living room, bedroom, garage, man cave, office, outside walls and more. You name it, there’s no wrong place to put this sign; hang it anywhere you want to proclaim your patriotism and revolutionary spirit! Get two - one for yourself, and one to gift. It’s easy with our unbeatable prices! No matter how many you get, or where you decide to hang it, get ready to turn some heads with this iconic “Don’t Tread On Me” Rustic Tin Sign! Very Nice Sign! Looks great in my garage.